Here's a quilt and a vocabulary lesson, all rolled neatly into one blog post. 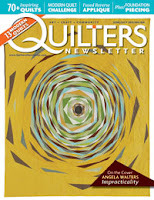 Stephanie Sheridan and Linda Leathersich of Stitched Together Studios recently designed this quilt for Quilter's Newsletter Magazine. Its name? As much a dimensional illusion as a work of quilted art, this design is a modern approach to the classic Attic Window concept, showing Paula Nadelstern's Fabrique-istan and Extreme Colors collections. Stephanie and Linda shared a bit about their stunning design with us. The name of this quilt, Fenestella, sounds like a Harry Potter character! Where did the name come from? Stephanie: Yes, we did name this quilt, but not after a Harry Potter character! The word "Fenestella" means a small window or opening in a wall. With this design being a modern take on a traditional attic window block we felt the name was a good fit ... and it is just a fun word to say! The fussy-cut squares really pop on the black. How did you decide on the design? Was it inspired by something? Stephanie: This design originated in Mom's mind and we worked through the design process together ... which means that she drew it with colored pencils on graph paper, then took a picture with her cell phone and texted it to me. That is as far as her technical skills go ... then I took over with EQ7. Our goal was to create a modern design that really showcased the "Prima Donna" fabrics as Paula called them. 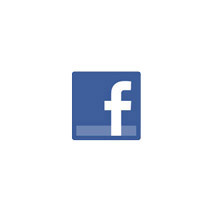 Why did you decide to make the squares different sizes? Stephanie: The feature fabric in the smaller windows is a smaller scale design, so it called for smaller blocks. 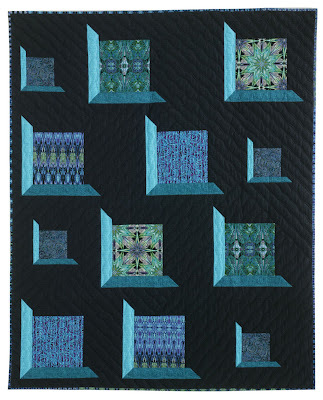 Love the contrast of the teal windowpanes with the black background. Was teal your first choice? Stephanie: We colored this design in several of the Fabrique-istan colorways, but we both love the color teal, so this was definitely our first choice. The Extreme Colors fabrics that Paula designed to compliment the Fabrique-istan line provided us with exactly the shading and contrast we needed to give Fenestella such a modern feel. Talk about the machine quilting design you used. Linda: The quilt called for unique, modern-style quilting and the asymmetrical diagonal wiggly lines fit the need. Using YLI invisible thread, I ditched the panes and blocks to make them pop off of the background. In the blocks I simply followed the designs of the beautiful fabrics. Love my older model non-stitch regulated Gammill longarm machine! People often find Paula's fabric intimidating to work with. Can you talk about why this design works so well with her fabric? Stephanie: I also used to find Paula's fabrics a bit intimidating, but once I got brave enough to cut it for the first time I fell in love with the versatility of the prints. This design highlights the focus fabrics with fussy cutting and the window frame colors. Linda: I also use a lot of Paula's fabrics; I love making tote bags with them! I find them easy to work with, whether I am striving for perfect matches, or cutting asymmetrically (or willy nilly). I love the fact that all of the colors blend so well together, even between colorways. Paula's Extreme Colors are the perfect blenders for any project. Stephanie: We love the clean lines of this quilt and the updated modern twist of the traditional Attic Windows block. Find out more about Stephanie and Linda here. See the entire Fabrique-istan collection here and Extreme Colors here. Find Quilter's Newsletter Magazine here. Superlative. To me it looks like the "windows" are literally floating. I am so totally amazed that even after all these 100's of years quilts have been around that new patterns are still being thought of.